An umbelliferous plant with white blossoms, which is peculiar to the Mediterranean district (Coriandrum sativum). It is widely cultivated in the East, and grows wild in Egypt and Palestine. It is especially abundant in the valley of the Jordan. Its fruits or seeds, which have a distinctly aromatic flavor, are used in the preparation of confectionery and also in ordinary cooking. They are employed medicinally to produce a stimulative effect and to relieve flatulence. The only allusions to the plant in the Bible are in Ex. xvi. 31; Num. xi. 7, where the seeds are compared to Manna. 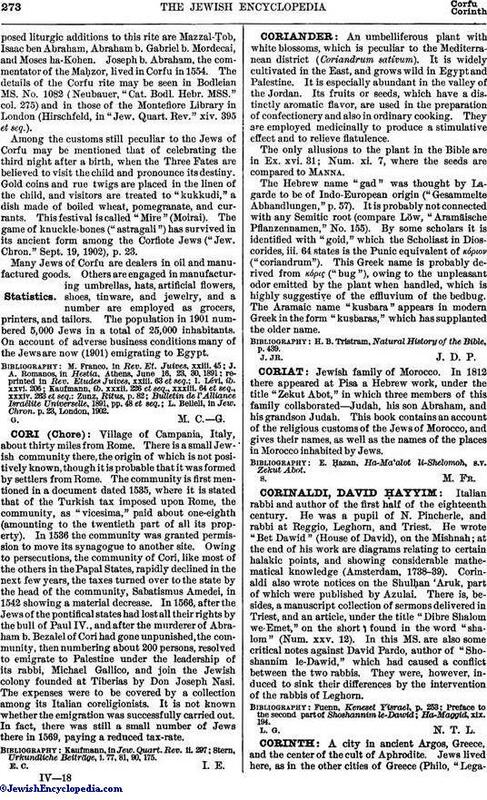 The Hebrew name "gad" was thought by Lagarde to be of Indo-European origin ("Gesammelte Abhandlungen," p. 57). It is probably not connected with any Semitic root (compare Löw, "Aramäische Pflanzennamen," No. 155). By some scholars it is identified with "goid," which the Scholiast in Dioscorides, iii. 64 states is the Punic equivalent of κόριον ("coriandrum"). This Greek name is probably derived from κόρις ("bug"), owing to the unpleasant odor emitted by the plant when handled, which is highly suggestive of the effluvium of the bedbug. The Aramaic name "kusbara" appears in modern Greek in the form "kusbaras," which has supplanted the older name. H. B. Tristram, Natural History of the Bible, p. 439.